It’s time for a Planet Whizbang Wheel Hoe review! 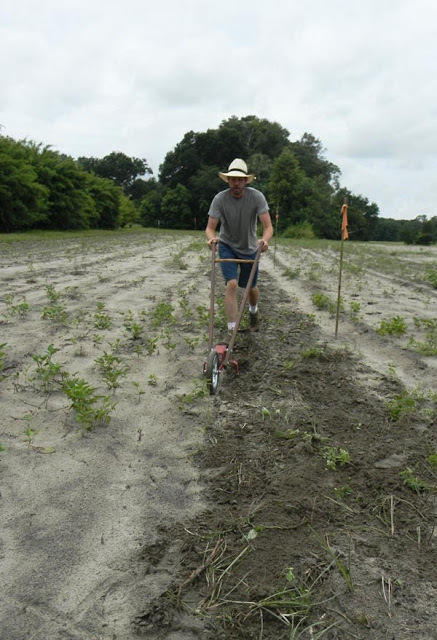 When I was offered the use of a chunk of land for my field crops, I knew some of my gardening methods needed to change. The plot we paced off was a quarter acre. That’s way too much space for raised beds, double-digging, or hoeing by hand. Unless you own slaves. And I don’t, since that’s wrong and bad. 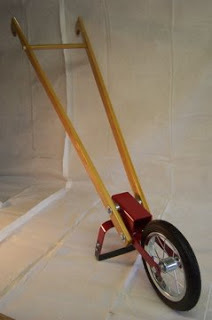 Some time back, I discovered an old school tool called a “wheel hoe.” It’s basically an oscillating hoe, also known as a scuffle hoe or hula hoe, with a wheel (or a pair) in front of it and two handles. The idea is that you can roll along a lot faster than you can walk and chop. You get extra leverage from the wheel and handles, too. I couldn’t really use a wheel hoe for my little beds… but the new plot finally provided me with an excuse to buy one. As I researched, I came across a model from Planet Whizbang. I have to admit: I’m a total fan of Herrick Kimball. The dude invented a chicken plucker you can build at home that will pluck a chicken in seconds. Most people sit around and watch TV – this guy solves problems. And, like me, he’s a homesteader. When I found out that he had his own version of the wheel hoe, I was already sold. The other thing that got me was this: you get to assemble it yourself. I like Legos, so this works for me. There’s a plan online, you buy a $99.00 hardware kit and a wheel from Northern Tool (coupons here: http://verified.codes/Northern-Tool). Get your bits together, paint ’em, start building, and VOILA! Wheel hoe! It takes a little basic carpentry skills, as in you need to measure and cut the handles, but other than that, building this hoe can be done in a couple of hours, including painting the parts. My handles are made of mahogany. Yep. Mahogany. Once built, this wheel hoe is a weed-eating machine. I took it through my corn patch and it performed admirably. I have the wide blade as well as the standard blade for it. The wide blade is very good in my large garden, since I can cover more ground with less walking. With tall weeds, the hoe tends to choke up and needs regular clearing, but with short ones it’s a champ. I used it on a piece of lawn as a test. Yes, you can clear it one chunk at a time but it will KILL you. 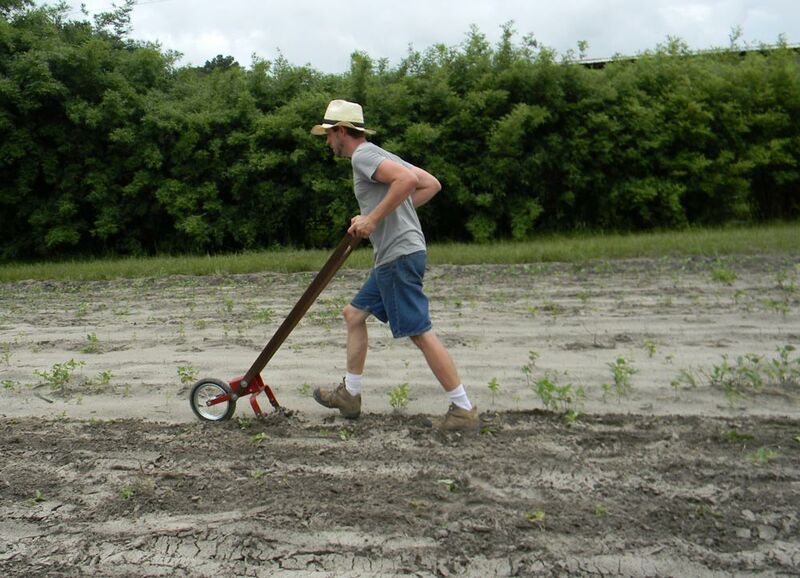 A wheel hoe is made for using in already worked soil. It’s a clean-up tool that’s not really suitable for breaking ground. Compared to a regular hoe, I can move about 10 times as fast through my garden. It doesn’t have the precision of hand-hoeing, but it’s really, really good on the straightaway. On the down side, the Planet Whizbang wheel hoe is for weeding only, unlike some of its competition. You can attach plow pieces, cultivators and even a seeder to some other wheel hoes. I suppose if you were clever, you could make some of those upgrades yourself. Right now they aren’t available. This is okay, though, because it’s a tough-as-nails little tool at a killer price. You don’t spend $124.48 and expect miracles. This wheel hoe seriously over-performs for the price. 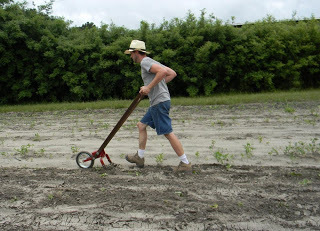 If you’re row gardening on anything larger than a couple thousand square feet, a wheel hoe is a really good investment. The Planet Whizbang version is a handsome little machine which is a lot more pleasant to use for weeding than a tiller. I’m happy with mine and it’s already killed many thousands of weeds. One warning: once you start pushing it around, it’s hard to stop. That's a very nice review! Here's wishing you many years of gardening success with your Planet Whizbang wheel hoe. Thanks, Herrick. It's a great tool. BTW, if you ever invent a sugarcane/sorghum cane press, sign me up as your first customer. I built one, too. Love Kimball's plans. Built his garden cart, too! We work both really hard at our farm near Galena, IL. The hoe is a weed eating machine. MUCH easier on the body than a regular hoe! I was also eying the garden cart with interest… looks good.